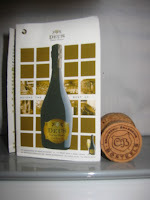 It was my birthday on Tuesday and, as you already have read, we hit Smokeless Joe's for a beer I have been anxiously waiting months to have an excuse to try, Deus Brut des Flandres. We needed an excuse as it is $51.25 for a 750 ml bottle. Teena bought it for me for my birthday, a well appreciated treat! I did share with her, though. The beer is made by family owned Bosteels Brewery located in Buggenhout Belgium, which was established in 1791. Currently it is being run by sixth generation Ivo Bosteels and his son. This beer is costly due to the time and the process to make it. First the beer is produced in Belgium using a summer barley recipe. After two fermentations, it is then shipped to France where it undergoes a champagne process. From the Belgium brew tanks to the final bottling in France takes months. The result is a champagne-style beer. It looks, pours and sits in a flute-like a champagne, constant aromatic bubbles bringing their aroma to the surface. It does not smell like a champagne and, despite its effervescence, has a slightly heavier taste than champagne. Our worst fear was at this price, we would hate it. Sure wasn't a problem. Both of us really enjoyed it. We could not nail down a description of the taste. If it was given to us blindly we would not have said beer and likely would not have said champagne. We would have just said, "It was damn good!!" I would recommend this as a beer to have on a very special occasion. I felt my 55th birthday was special enough. Thanks Teena!!! Another reason you're the best wife ever!!! You're welcome! Thanks for sharing!